Scroll through this document to see a description of all the features that are new since v11, or click the links below as a short-cut to any topic of interest. Improvements added in the November 2016, March 2017 and July 2017 updates are marked Nov 2016, March 2017 and July 2017. You can find details on updates after December 2017 (v15) here. We offer an upgrade path from all older versions, available now on magix.com. We know that many of you find it frustrating to have to wait a whole year for our next update - knowing that we are working on (and likely finished) new cutting-edge features and on-trend content. From our side, developing features for 12 months before they are released is equally frustrating. We would rather get features into your hands as soon as they are done. So we’re changing the model. We are moving away from yearly releases, and even from ‘headline’ version numbers. For the 365 days from purchase you’ll get access to new feature, updates and content. At the end of the 365 days you can choose to upgrade again, or not. If you choose not to, then you can continue to use the program, but the online service components such the web hosting and the Online Content Catalog will be disabled or restricted (these are online services anyway that would typically be part of a subscription). It’s important to note this is not a subscription service. Unlike other products such as Office 365, or Adobe Creative Cloud, the program you purchase is yours to keep, and will keep functioning with no further purchases. This new approach also means features developed during the next year, which would typically be part of next year’s update, will be made available as soon as they are completed. So you’re getting next year’s features included in this year’s product. We believe this move away from once-a-year major updates, towards a more regular update process is better for our customers. The Update Service gives you 365 days access to: • The new Online Content Catalog, including any new templates, graphics and designs, photo filters and SmartShapes • New program features and upgrades released in the 365 days after you purchase and register. Note: these updates continue to work after 365 days but if you reinstall the software after the Update Service expires (and you don’t renew) then it will be the same version as feature set as you originally purchased. Now when you select a photo or SmartShape in the Selector tool, you see smart handles without having to first switch into the Photo Tool or Quickshape Tool, so you can directly edit these objects without having to switch tools. You can revert to showing the normal selection bounds handle using the toggle button on the left of the Selector Tool infobar. When you embed a single object in text, you can now directly select that object in the text instead of selecting the “Embedded group” that encloses it. A similar improvement has been made for anchored objects, repeating objects and live copies. You can now paste the contents of the clipboard to any number of pages in your document. Simply select the pages you want to paste to in the Page & Layer Gallery. Ctrl+click on a page thumbnail to add it to the selection, or use Shift+click to add a range of pages to the selection. Then paste (Ctrl+V). This is especially useful if you have copied a repeating object that you only want on some pages of a document. As with SmartShapes, hold the mouse pointer over any handle to reveal a pop-up tip for that handle. If the image is made larger than the frame (in other words clipped), which can happen if you reduce the edges of the frame inwards, or use the rotate/scale handle in the top right to enlarge the image, then the ‘hand’ control can be used to re-position the image within the frame. 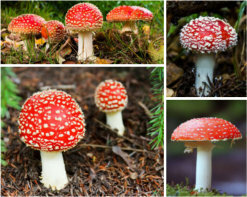 There are numerous benefits to this new method of manipulating photos:. • It’s super-easy to scale and rotate the image within its frame, (like a masked operation) directly from the Photo Enhance Tool. • Drag the outer top right corner to rotate the whole image (frame and photo). • Both rotate operations (internal and whole image) display the rotation angle as you rotate. • The side handles can be used to change the shape (aspect ratio) of the photo, but the image is never stretched - it is scaled, keeping the correct aspect ratio, to fit whatever frame size you want. • Dragging the side handles inwards clips (masks) the image within the frame. Use the ‘hand’ to re- position the clipped image within the frame. • It’s easy to adjust the horizon of landscape images, without introducing gaps in the corners. • It’s easy to give any photo a rounded corner. • If you rotate the image, all these operation remains functional. You can still use the Fill Tool to manipulate a photo fill, which works the way it always has. To reset a photo back to its ‘best fit’ state, double click on the rotate/scale handle. To center the image in its frame, double click on the ‘hand’ icon. To un-clip an image double-click on one of the side handles. These smart photo operations also work with photos of any shape, not just rectangular photos and with photos within groups and Soft Groups. Smart photo editing has been improved so that as you drag the handles to adjust an image, a faint copy of the full uncropped image is shown behind. This makes it easier to make adjustments because you can see parts of the image that fall outside the crop area, as you drag the handles. Also (Mar 2017) Smart Photo now behaves better with photos that don’t already fit into their frames (there are unfilled gaps) - it no longer attempts to immediately remove the gaps as soon as you drag on a handle, making small adjustments possible. These are aesthetically pleasing arrays of photos, but in a fixed arrangement. You can replace any photo by dragging a photo file (typically a JPG or PNG) from your Windows File Explorer on top of any image in the grid. You can then use the new photo tools described above to adjust the image within its frame, but it’s not recommended you change the crop or size of the individual images. This is a more flexible SmartShape that lets you display any collection of photos, even those with different shapes and aspect ratios, in a compact grid. You can adjust the number of photos on each row, or number of rows, drag re-order the photos, and adjust the gap between all the photos. As with all SmartShapes, double-click on it in the Selector tool to show the control handles. In the Online Content Catalog (Menu Insert > From Content Catalog.. and select the category Components > Image resources > Photo Grids). All the SmartShape photos (as opposed to the Static ones) have ‘smart’ in the title. To use the new Photo Controls on individual images, go into the Photo Tool and click on an image. Each time you replace an image, it puts you into this Photo Tool mode. To get back to the SmartShape handles use the QuickShape Tool and click on a photo, or go back to the Selector Tool and double click again. To replace an image with your own photo, just drag and drop a photo file from Windows Explorer (or from the Bitmap Gallery if the photo is already in the current document). The image in the grid that you drop onto is replaced with your photo and the grid automatically updates to fit your photo in. In this first release you can’t adjust the crop of images within the grid, but we hope an update to SmartShape photo grids will address this. To add more images click the green ‘Add photo’ handle on the right end of each row, or drag the ‘Add/Remove rows’ handle at the bottom left of the grid to add a complete row. Note: The height of a row is calculated by fitting the number of images in this row into the width of the grid. So the more images per row, the less tall that row is, especially if the images are wide such as panorama photos. Similarly rows containing just a single image will usually be taller. 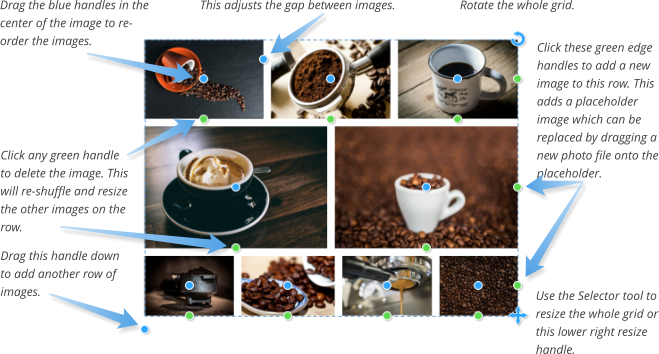 There’s a Border width handle on the top left photo in the grid that lets you adjust the space between each photo. You can have no space at all if you choose, but when you do have a border it’s simply empty space between the photos so you see whatever is behind your photo grid. Therefore if you want to see something other than the page background behind, just draw a rectangle behind with the desired color. Photo filter presets allow you to instantly apply ready-made photo effects to your photos. The presets are provided in the Online Content Catalog under Components > Image Resources > Photo Filter Presets. You can apply them directly from the Content Catalog by selecting the photo and then choosing Insert > From Content Catalog. Below are are just a few examples of available effects, applied to the same photo for comparison. When you replace an image with a new one (using drag and drop from Explorer or right-click Replace photo…) any preset effect is retained. Once you’ve imported one preset, you can optionally download all the presets to your Local Designs Gallery, for easier access. 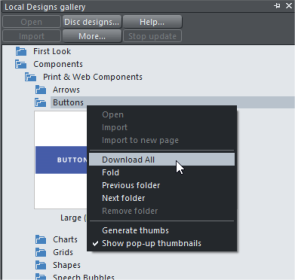 Open the Local Designs Gallery and navigate to the corresponding folder: Components > Image Resources > Photo Filter Presets. Right click on the folder name and choose Download All. The folder closes once it has downloaded to your disc. Re-open the folder and now you can drag and drop any of the effects onto your photos, or select the target photo and double click an effect in the Gallery. a photo and so these will replace each other. In other words, only one of these presets can be applied to a photo and applying a second will automatically remove the first. However the Overlays folder contains various different classes of presets that can be applied in addition to any of the presets under the Filters folder. So for example this photo on the left has had the Softlight filter effect applied from Filters > Effects and also the Stripes pattern, from Overlays > Patterns. Each of the presets in the same sub-folder under Overlays will also replace each other, because it wouldn’t be useful to have for example two different patterns applied. But you can mix presets from each of the other folders under Overlays as much as you like. So you could for example apply a check pattern from the Patterns folder, a texture from the Textures folder and a transparency effect from the Transparency folder all to the same photo. When you right-click on a photo, you will see a Photo Filter option in the context menu that appears. This option has a sub-menu, which allows you to apply filters to your photo and remove filters that are already applied. The Apply filter… option opens the Content Catalog onto the Photo Filter Presets folder so you can apply a filter to the selected photo. Following this option in the menu, you will see Remove options for each of the filters you currently have applied to the photo, so you can remove any of them. The final option in the menu allows you to clear all applied filters from the photo. The overlay effects under Overlays > Transparency work by applying transparency effects to your photo directly. You can see and modify these effects by selecting your photo and going into the Transparency Tool . In Nov 2016 we added 50 more new photo filter presets. The set of available presets is now separated into sub-folders in the Content Catalog, but you can still download all of them to your Local Designs Gallery as described above, for easy access. Approximately 40 additional presets were added in this update, including transparency effects and the ability to apply multiple classes of filter to a photo, as described above. In this update we’ve added 10 more new photo filter overlays, these are predominantly camera effect type filters - give your social media profile pictures a great photo finish! Designer Pro now supports 2 additional W3C standard blend modes in the Transparency Tool, Color Dodge and Color Burn. Dodge lightens images and Burn darkens them. Some of the effects in the new Effect Painter tool use these blend modes, see below. Choose the effect you want to apply from the list on the left of the InfoBar. For example the Desaturate effect will reduce the color saturation on the areas you paint onto. Choose a nib/brush size using the Size control. Note that by default, as in the Shape Painter tool, the on- screen nib size stays the same as you change the zoom, which makes it easy to zoom in and work on small detail, or zoom out and work on larger areas without also having to change the nib size. However if you prefer you can switch to an absolute nib size by clicking the Size toggle button. Use the Softness control to give your strokes a soft edge by feathering, so the edges blend into the photo, instead of having a hard edge (softness 0). When you start painting an effect, you are creating a new region shape on top of your photo. Just as with the Shape Painter and Region Painter, additional strokes on top of the existing region will enlarge the region. Hold down Shift while you paint and you can un-paint and so erase the edge or any part of the shape. So it’s very easy with these tools to paint accurately over any desired region of the photo. Tip: Remember using Ctrl + mouse wheel to rapidly zoom in and out, without changing tool, allows you to change the relative size of the brush so you can paint in as much detail as you like. Left: I’ve painted a region using the Desaturate- medium effect. The ‘marching ants’ dotted outline shows the region is selected and active still. Press Ctrl+H to show/hide the outline. Effect Painter or Photo Enhance tools. Once selected, you can modify it as described above. Press the Delete key to delete any selected region. Xara Designer Pro is using vector-based, non-destructive editing of photos when you apply effects and regions this way. Each region is a vector shape on top of the photo. If you use a soft brush, you’re creating a feathered shape instead of a hard edged one, but it remains an editable vector shape. All your edits are contained in a group associated with the photo - which is why the status line calls this a Photo Group. For advanced users, you can see the structure of a Photo Group in the Page & Layer Gallery. You can also use this to see and select any regions ‘inside’ your photo. The Page & Layer Gallery showing I’ve made three separate region edits to this photo, Desaturate, brighten and darken. Using Ctrl+click or this Page & Layer Gallery I can select and edit these regions at any time in the future. The advantage of this approach is that no pixels of your original photo are altered. It’s easy to go back, at any time in the future, and adjust any of your previous edits. Use Ctrl+click to select inside, then you can drag the region around with the Selector Tool to see this object-oriented approach to photo editing. • Feathering/softness setting now preserved across effect type changes • Improved naming of Regions inside the Photo Groups. This is a new effect on on the main Photo Tool InfoBar. Cross processing simulates a photographic processing technique which historically used the ‘wrong’ chemicals to develop film - thus resulting in some dramatic contrast and saturation effects. Designer Pro and other photo editing programs achieve this by manipulating the red, green and blue color channels. Use the slider to experiment. This is for cutting objects from photos. The old Freehand Region Tool has been enhanced and re- purposed as the Magnetic Lasso Tool because it can now automatically detect outlines of objects as you trace out a region. This allows you to semi-automatically trace around an object in a photo to create a region. Once the region has been created you can copy or cut the object out, or apply an effect or enhance this region as usual. 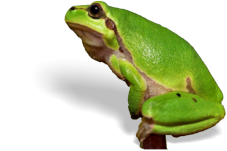 A frog cut out of photo, with floor shadow applied. snap, then dragging acts exactly drawing with the freehand tool. Clicking with no magnet snap will just add a straight line segment to the current point. Sometimes you may want the outline to follow the straight outside edge of the photo. To do this, click just outside the photo edge. When you get back close to where you started, click on the start point again to complete a closed outline (the mouse pointer will change to show a + sign when you are over the start point) . Once you have a complete closed outline, you can now copy (Ctrl+C), cut (Ctrl+X) or delete the selected part of the photo. Or switch into the Photo Tool to enhance the selected region. Once you have cut out an object, you can usually improve the edges by applying a small amount of feathering using the feather control on the top bar. During the trace operation you can turn Magnetic effect on and off using the toggle button on the InfoBar (or using shortcut key “T”). Background Erase or Magnetic Lasso? There are two ways to cut items out from the background. You can use the automatic background erase which is part of the Eraser Tool. Or you can use this Magnetic Lasso tool to create a region around the image which can then be cut out. Which is best? The automatic background erase feature creates a new bitmap with the background erased. This is a pixel based operation, creating a transparent (alpha-channel) image. It works best when there’s a lot of complicated detail, or soft edges where there’s not always a clear edge. Cutting around fur or hair with the Magnetic Lasso tool is impractical. 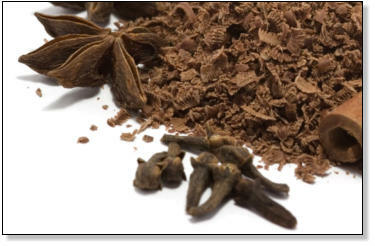 Take this chocolate example. There are lots of fiddly bits that would be almost impossible to trace around with the Magnetic Lasso. Using the automatic Background Erase (in the Eraser Tool) on the other hand, would take only a few seconds, and create an extremely effective result, as seen below, where the cut out result is placed on a different color background. 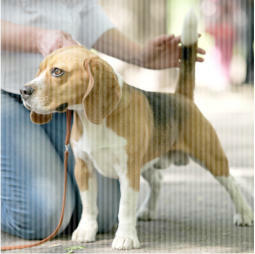 Where there is a more complex background that either has very complex edges, such as hair, fur or this type of image, then the automatic background erase would usually be better. This even knows to make shadows semi-transparent so they work on different colored backgrounds. PanoramaStudio is a separate program for automatically producing natural-looking wide-angle pictures and 360° panoramas by combining multiple overlapping images. 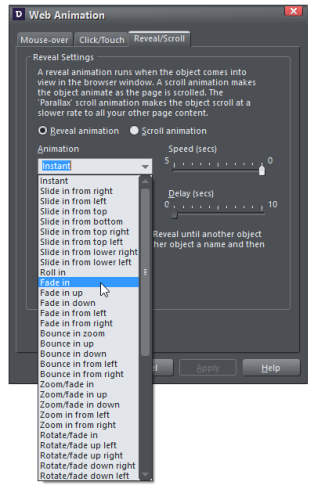 40 new reveal animation types have been added to the Reveal/Scroll tab of the Web Animation dialog (Utilities menu), in addition to the simple slide and fade animations that were in Designer 11. Reveal animations happen as you scroll, or reveal, parts of the website. It’s a fashionable effect that can highlight specific content and makes websites more interactive and fun. But in addition to all the new animation types we’ve added scroll-linked animations and parallax scrolling effects. Select the item you want to animate on reveal, and the menu Utilities > Web Animation… to show this dialog. There are now two options; Reveal or Scroll animations. This shows the drop-down list of some of the possible reveal animation types. The top option ‘Instant’ is the same as no reveal effect. Reveal animations are triggered when the item is first shown in the browser. The speed slider controls how fast this animation (how many seconds it takes). There’s a ‘Once only’ check box to control whether this reveal animation happens every time the items is revealed (e.g. when scrolling it off and then back on screen) or just the first time. An alternative to reveal animation are scroll animations. Scroll animations are similar to reveal animations, but the position on the page (or other values such as the amount of fade) is linked to the scroll position. The more you scroll a page, the further the animation moves. This also means the faster you scroll the page, the faster the animation happens. Instead of the animations running once when the object first appears and then finishing, the object animates whenever the document is scrolled. 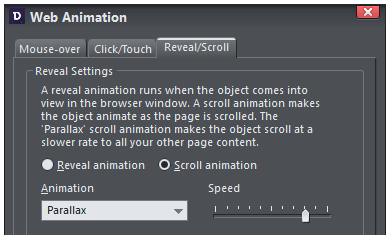 When you select the ‘Scroll animations’ option, from the same Reveal/Scroll tab of the Web Animation dialog (menu Utilities > Web Animation…) the top item in the drop-down menu is called ‘Parallax’ followed by a long list of alternate scroll animations. The ‘speed’ slider determines how fast the animation runs relative to the scrolling speed. So if it’s set to a high value the animation completes quickly, almost as soon as you scroll it up into view, so the object will only be animating when it first appears close to the bottom of the window. If speed is set to a low value, the object won’t complete its animation until it’s scrolled much further up the window. Note that you can’t have a scroll animation on a sticky object or an object set to ‘stick at top’. Parallax scrolling is where some objects on your page scroll at a different rate to others, giving a parallax effect. The ‘Parallax’ option appears at the top of the list of scroll animation types. The speed slider determines how fast the object scrolls relative to other objects on the page, with values between 100% (moves same as normal objects) and 0% (which means it sticks on the page). So with a midway setting, items will scroll 50% of the usual scroll speed. If set very low, the object hardly moves at all as other objects scroll past it. If set very high the object scrolls at almost the same rate as the other page content. So the most useful speed values are towards the middle, but you can experiment with different speeds. Note: If you have a low parallax scroll speed, items below the bottom edge of the browser window may never appear. How to use Reveal, Scroll and Parallax Animations. the appropriate browser icon in the preview window. Web Designer 11 allowed you to make an object ‘sticky’, which means it floats above other page content and is positioned fixed relative to the browser window, so it’s always in view. There is now a new ‘Stick at top’ option (menu: Utilities > Web Sticky/Stretchy) an alternative way of keeping objects such as navigation bars in view. A ‘Stick at top’ object starts off on the page where you place it, and scrolls with the page just like all your other page content. But instead of scrolling off the top of the window, the object sticks to the top of the browser window and so stays in view. Therefore it’s great for navigation bars. An example website with a ‘stick at top’ NavBar. This will remain at the top of screen no matter where you scroll in the document. Example 1: Charity website A contemporary design combining parallax scrolling, with multiple scroll and reveal animation effects. This is also a responsive website - make the browser narrow to see the mobile variant. Example 2: Able website A ‘stick at top’ NavBar, and slide-in reveal animations on the header bar. There are 6 pages to this website each with different examples of animation effects. Example 3: Fresh single page website A reveal animation for the heading, a ‘stick at top’ NavBar. Lower down the page there are various new hover (mouse-over) effects in a few picture galleries and a roll-in animation applied to the new Percentage ring SmartShape. Example 4: Pagoda single page website. 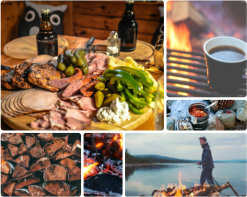 Shows parallax scroll on the top image and heading. Has a number of scroll based animation effects. Read the description in the file for more info. Page transitions (animation shown when moving from one page to another in a web browser) have been improved so that they are smoother, more reliable and more consistent across the different web browsers and devices. 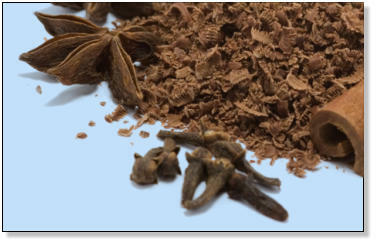 Normally if you group multiple objects together, those objects are exported as a single image in your published website. For example if you group a photo with its caption text, the whole group, photo plus text, appears as an image in your website, so the text is not selectable in the web browser. Now there is a new option to control how groups are exported, in the Utilities > Web Properties dialog, in the Image tab. See the Group images section at the bottom of the dialog. 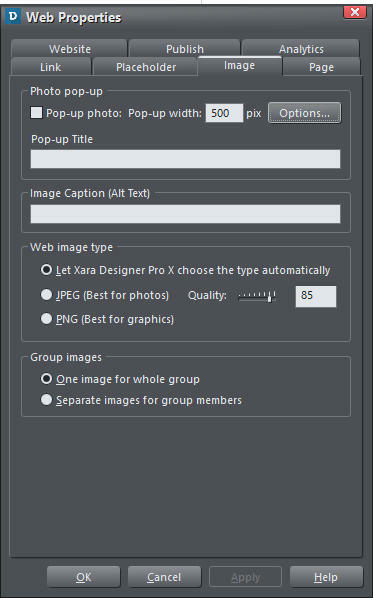 By default, existing groups and new groups are set to One image for whole group, so groups will export to your website as with earlier versions of Designer. But if you change the setting to Separate images for all group members, then the grouped objects will export individually as if they were not grouped at all. It’s not advisable to use this new option on very complex groups such artwork that is made up of tens or even hundreds of vector shapes. It’s more efficient for such groups to export into the website as a single image, as with earlier versions of Designer. But for simpler groups such as a group of photos, it’s best if they are set to export separately because then each object can have its own individual settings. For example each photo could be set to be a popup, or have its own reveal animation. And it’s especially useful for groups containing text, so the text remains as text in the published site. Once you have changed this new property on a group, so it’s set to Separate images for group members, Designer will then allow you to set properties on the objects inside the group. You can use Ctrl+click to select objects inside the group and then apply links, reveal animations, etc. to the objects. The Xara Slideshow widget (the first item in folder Components > Image Resources > Photo Slideshows & Galleries) now supports the option to make the photos span the full width of the browser window. To turn this option on, right-click on the widget on the page, choose Web Sticky/Stretchy… in the context menu and turn on the Full Width option in the Sticky/Stretchy dialog. There are significant enhancements to the SmartShape system and new SmartShapes that are a lot more powerful and complex and begin to show the real power of this system. New chart and photo grid SmartShapes SmartShapes are a way enhanced functionality can be added to Designer. SmartShapes are plug-ins. We (and soon third parties) will continue to release new SmartShapes. Each SmartShape incorporates its own editing controls, usually in the form of small handles you drag to adjust the shape. 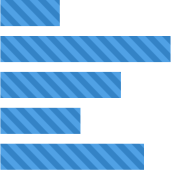 Although there are simple SmartShapes that are just a single shape, such as this arrow design, the underlying SmartShape architecture now supports much more complex examples, including charts and percentage segment indicators, grids of photos that can be customized and improved smart text panels. Some examples of percentage segment SmartShapes. In the Text Tool you can enter a new value and the chart adjusts. Or drag chart and the value adjusts. These SmartShapes are automatically matched to your document Theme Color SmartShapes are entirely self-contained. No new tools are required. You just double-click on the SmartShape (or select the QuickShape tool) to reveal its editing controls. Designer Pro now shows larger and clearer handles on SmartShapes when editing. You can edit SmartShape simply by double-clicking on the shape in the Selector tool. Alternatively, select them using the QuickShape (or rectangle or ellipse) tools from main tool bar. When selected the SmartShape will show a set of control handles on and around the shape, like this: This is a simple Text Panel SmartShape. The blue circular handles on the sides allow you to stretch the panel to be any size. The top right corner handle will rotate the whole object. The bottom right will enlarge or reduce the size of the whole SmartShape. Each SmartShape has its own set of control handles. Hold the mouse-pointer over any handle to get a tool-tip hint of the function of each. The Status Line (bottom of window) also provide some description of the function of each handle. In this example the top left orange handle adjusts the rounded corner of the panel background (and most rectangular SmartShapes have a similar function). The inset handle at the top right, in this case, adjusts the margin around the text. 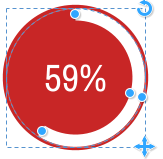 This percentage segment SmartShape has controls to drag either end of the segment (doing so will update the value), or using the Text Tool you can edit the value, in which case the segment bar is changed. The handle mid-way around the arc allows you to adjust the thickness of the band. The top right handle will rotate the whole thing, the lower right will resize it. When you insert a SmartShape, many of the colored ones, will take on Theme Color 1 of your document (in this document a dark red). Improved mouse pointers shown over SmartShape handles. The Online Content Catalog includes new charting SmartShapes, with bar, column charts and a variety of circular ‘percentage’ indicators. The menu Insert > Charts is a short-cut to the chart category. You can just edit the values and labels on the charts using the Text Tool and the graphics update accordingly. Or you can drag the graphics and the values update. When we add new SmartShapes, they will appear in the Content Catalog automatically. As with all SmartShapes, double-click on the SmartShape to go into the QuickShape tool and reveal the control handles. Instead of complex dialogs, or charting tools, almost all aspects of chart SmartShapes can be adjusted by simply dragging on the control handles, or directly editing the labels and values. Below is an annotated diagram of the controls. Move the mouse pointer over each handle for a tip on what each does. Entering precise chart values: You can drag the bars to adjust the value. If you need more resolution or accuracy, just zoom in and drag. Alternatively you can enter any precise numeric value, even with decimal places, using the Text Tool. The example chart SmartShapes are quite simple, but we anticipate that we, and third parties, will release more powerful charting SmartShapes over time. These will just appear in the Content Catalog as we make them available. You can change the colors of charts easily just by selecting the whole chart and clicking a color on the color line or dragging a color onto the SmartShape. The Replace Colors dialog appears to let you choose which of the colors in the chart you would like to replace with your chosen color. Alternatively the Color Editor to edit the colors - the list of replaceable colors appears at the top of the color editor, so select the color you want to edit from that list. Sometimes you may need to do more than just replace or edit the existing colors in the chart. You can select a specific bar or column inside the chart using the normal ‘select inside’ short-cut of Ctrl+clicking on it in the Selector Tool. That selects just that bar/column inside the chart. Then you can change its color directly, or its outline, or even change the type of its fill using the Fill Tool. If you want to copy the style of one bar onto the other bars, first copy (Ctrl+C) the selected bar to the clipboard. Then select one of the other bars and use Edit > Paste > Paste format/attributes or the simpler short cut Ctrl+Shift+A. The Chart labels and value can be edited using the Text Tool. You can apply the usual text attributes, to adjust the appearance of the text. Both the labels and values have separate Text Styles applied, and so by using the usual Text Style update to apply any style change to all the labels or values. (From the InfoBar menu of the Text Tool, select the Style drop-down and select ‘Update Style to Match’). In the Online Content Catalog you can find some new Text Panel SmartShapes (short cut menu Insert > Shapes > More Text Panels… but they are also under the Components > Print & Web Components in the Content Catalog. These text panels are smart in that they grow to accommodate whatever text you put in them - you can freely edit the text using the Text Tool. 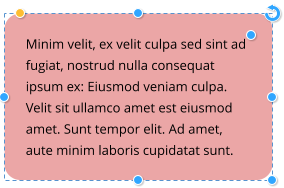 If you display the SmartShape controls (double click on it using the Selector Tool or the QuickShape tool) you can adjust the width and height (and the text re-flows), the margins around the text and the corner roundedness of the whole panel. You can also rotate the whole object and it remains fully functional. In addition we have a collection of similar panels containing photo and text. You can find these in the Online Content Catalog under Image resources > Photo Panels. 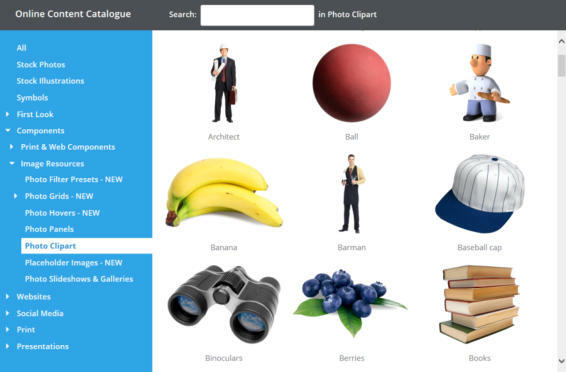 See the Photo Features section above for details of these new SmartShapes for arranging photos in grids. 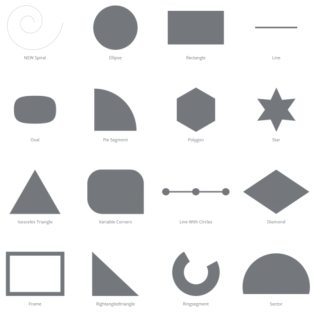 There are new simple SmartShapes available from the Online Content Catalog under Shapes category (Short-cut menu Insert > Shapes > More Shapes…) Each of these is a customizable by dragging on the SmartShape handles. 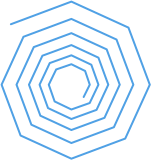 You can now vary the number of sides on the spiral SmartShape, and vary the spacing to be non-linear to produce 3D effects such as this. The new Chevron Bar SmartShape (Insert > Shape > Arrows…) is particularly useful in presentations. Drag on the different handles to add/remove chevron shapes, re-order, change the arrow angles, etc. And of course just click on the text in the Text Tool to edit the labels. Most of the arrows in the arrows folder (Insert > Shape > Arrows…) can now be changed to use a variety of different head and tail designs. Click or drag on the green style selection handles to cycle through all the available styles. Timelines are common in many types of documents and particularly in presentations. The Timeline SmartShape consists of a line with an object (or group of objects) repeated along its length with regular spacing. You can increase or reduce the number of objects on the line, adjust their spacing, size, vertical alignment, etc. using the SmartShape’s handles. To insert a Timeline, use Insert > From Content Catalog > Components > Print & Web Components > Timelines. End handles Drag either end to change the length of the line, or rotate the whole line Spacing Drag to adjust the spacing of the objects on the line and therefore determine how much of the line sticks out on each end. Add/Remove Click to add a copy of the rightmost object, or drag to add or remove multiple objects. If nothing happens when you try to add a copy, that means there is not enough space on the line to fit another copy. Try reducing the size of the objects using the Size handle, or extending the line length by dragging it out. Vertical offset Drag to adjust the vertical positioning of the objects on the line. Delete Delete an object from the line. Line width Drag to adjust the width of the line Size Change the size of the objects on the line. Many of the Timelines include text, which of course you can edit using the Text Tool. If you find you can’t fit the text you want into the space available, try increasing the size of the objects on the line using the Size handle and then select the text and reduce its font size, so you can fit more text in. If the change the font size of all the text on one object, you should see the text on all the other objects update too, to help you choose the size that fits best. SmartShapes are a way of extending the functionality of Designer series of applications. The examples shown here are just a sample of what’s possible. If you’re a developer we’ll soon be releasing the plug-in API so you can start adding your own SmartShapes - or just enhancing the existing SmartShapes, as we expect to release the source code of most of the SmartShapes we’ve created. If you’re interested in learning more about this, email us at smartshapes@xara.com and we’ll make sure you get information when we launch this to the outside world. An enhanced Online Content Catalog is included free for one year as part of our new Update Service. It now offers:- • Regular updates to the templates and content as part of the Update • Full keyword search of the entire catalog • A new more logical structure to the content offering a better work flow • Brand new Stock Photos and Stock Illustration sections - see below. Normally when you click on the Import button over the item you’ve chosen in the Content Catalog, the item is imported and the Catalog window closes. Now if you hold the Shift key down when clicking Import, the item is imported and the Catalog is kept open. This is useful if you want to try out several different items without having to keep re-opening the Catalog. All content is now searchable, making it much easier to find templates and components to add to your document or website. Select a category folder on the left and then enter a keyword in the search field to search in that category only. Or select All on the left to search all available content. This is unlike most stock photo libraries you may be used to, where you purchase a ‘royalty free’ image, with restricted license terms, often with limited production runs, limited reproduction rights, no re-distribution rights. An increasing number of photographers are submitting their work to the public domain, in particular under a license called CC0, which is a very liberal license, totally royalty free, where you can use the image for personal or commercial use with almost no limitation. Read more about the CC0 license. 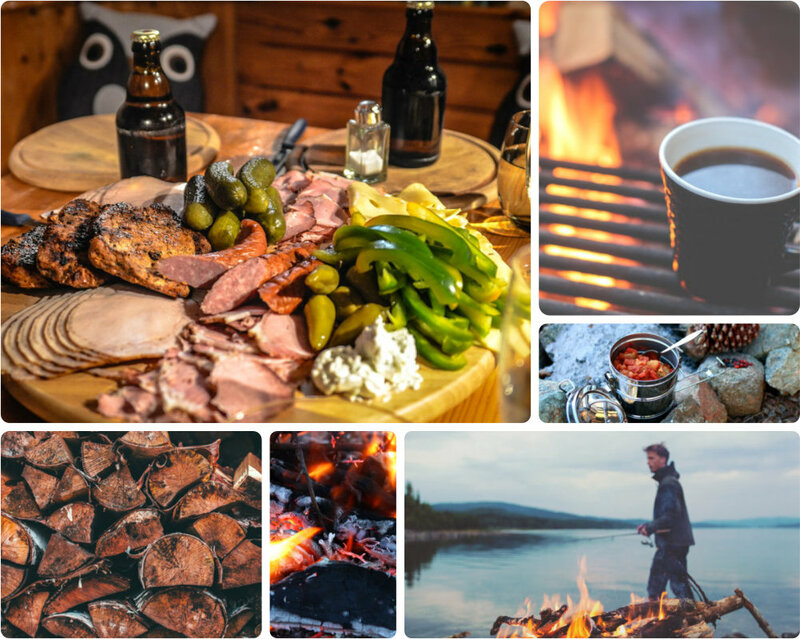 In conjunction with Pixabay, a website that collected and collated a huge number of high quality CC0 images, we have included a section in the Content Catalog where you can search and download hi-res photos directly into Designer. Their collection includes high-quality images from sites such as Unsplash.com and other collections of CC0 licensed content. The first time you import one of these photos you will be asked to read and accept Pixabay’s Terms & Conditions. But you only need to do this once on each computer you use, then you can import as many photos as you like. Before this update photo resolution was limited to HD (1920x1080), but now when you import a stock photo into a print document you get the photo’s full resolution into your design. The resolution of photos varies, but most are much higher than HD resolution. When you import into a web document, as when importing local photos, the resolution is still limited to HD because it’s rare to need any higher resolution than this for a website. In addition to stock photos, there’s now an additional category of vector graphic ‘stock illustrations’. All the images have keywords so you can easily search for the graphic you want. 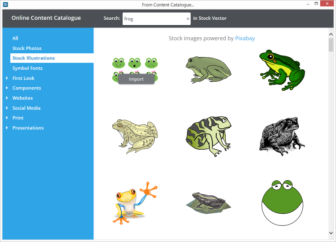 Select the Stock Illustrations category on the left side and enter a search term, such as Frog - see left. Because the original vector files vary enormously in size, graphics larger than around 300px are scaled down. Also un-grouped images, are placed in a group for ease of manipulation. Because this is vector clipart, it’s re-sizable to any size without loss of quality. The Designs Gallery has now become the Local Designs Gallery. As the name implies, this now shows only content that you have present locally on your device, either because it was installed with the program using the optional backup CD, or was downloaded from the Content Catalog. This makes it easier to find and access designs you use regularly. The folder structure in the gallery still mirrors that of the Content Catalog and each folder in the gallery has a link allowing you to jump straight into the corresponding folder in the Content Catalog, so you can easily view what other content is available for download into that folder. Whenever you open or import a design file from the Catalog, that file then appears in the Local Designs Gallery and so you can use it even when offline. As just mentioned the Design Gallery (right edge of the window) now shows content that has been previously downloaded, that is cached on your local hard drive. This is therefore available while working offline. For example if you download a button from the Online Content Catalog (from Components > Print & Web Components > Buttons) then there will be a corresponding category created in the Local Designs Gallery. You can download the whole category (in this case all the button designs), so they all available offline, by right clicking on the category name, and selecting this ‘Download All’ option. The Symbol library is a great source of high quality vector icons symbols, and we’ve made it even better. We’ve added Google’s Material Designs symbol font to the library (menu Insert > Symbol… and also from the Content Catalog) to provide over 1500 high-quality open-source vector symbols. These can be used as editable vector graphics on the page, or inline symbol font characters in text. To insert the symbol in the text, in the Text Tool, just place the text caret where you want to insert the symbol and select the symbol from the picker.  If you insert the symbol on the page, it’s created as a simple vector shape. You can adjust its fill, shadow, outline, shadow using the usual tools. The Font Awesome and Google Material Design fonts are updated quite regularly with new symbols. When this happens you’ll be prompted when you open the symbol picker. It’s important that you choose to accept these updates because the symbol picker and Content Catalog always show symbols from the newest font versions, so if you’re not up to date you may find symbols you choose appears as a black rectangle. The symbol library is now searchable - enter a keyword in the search field at the top of the symbol picker to find matching symbols in any of the symbol fonts supported. e.g. search for ‘face’ to find all Facebook icons, or ‘credit card’ to find all credit card designs. To replace a symbol, right-click on it and choose Replace symbol… from the context menu. This brings up the symbol picker, where you can search for a new symbol. You can also use this operation in bulleted lists to replace the symbol used for the bullet points. Place the text caret in the list, right-click and choose Replace symbol… July 2017 update - this now also works if the symbol is inside a group so you don’t have to perform a “select inside” operation first. If you make a non-rectangular object repelling, by default the text flows tightly around the object, following its outline, as demonstrated by this ellipse on the right. Now you can choose to make the text repel around the rectangular bounding box of the object instead, ignoring its outline, as for the second ellipse below left. This rectangular repelling option is also more efficient if your document or website has long text flows and has a lot of repelling objects that are also anchored to the text (as both ellipses here are). Therefore this is now the default option when you turn repelling on for rectangular objects. 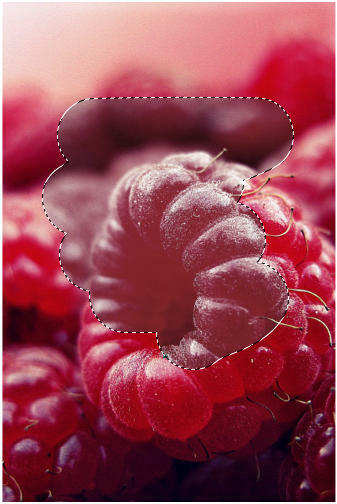 Non- rectangular objects, such as the above ellipses and transparent PNGs default to ‘tight’ repelling around the shape, or transparent parts of a PNG bitmap. 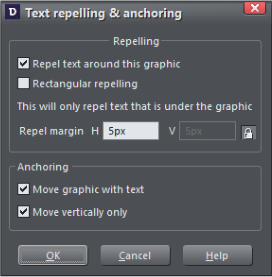 You can control the repel margin - how close the text comes to the edge of the repelling object. You can access this dialog by right clicking on the item to repel, and selecting the Repelling & Anchoring… option, which also appears under the top level Arrange menu. Auto-kerning (the small adjustment of the overlap of certain pairs of letters such as ‘Aj’) in earlier versions of Designer works only with older TrueType fonts. Work has been done to support kerning on newer OpenType fonts, so now many newer OpenType fonts now render with the correct kerning. Most modern web browsers also automatically support the correct auto-kerning. Right-click on a text selection in the Text Tool and choose from the new Change case to… sub-menu in the context menu. The spell-checker menu now includes options to change the language of all text in your document at once, instead of having to set each text object separately. In previous versions of Designer, the Text Tool InfoBar had a flyout bar on the end, which gave access to additional text controls that wouldn’t fit on the main InfoBar. Alternatively users could choose to have an extended Text Tool InfoBar, containing all controls. We’ve now replaced both these options with an additional toolbar which you can turn on and off using the button toggle button on the end of the Text InfoBar. When turned on, the additional bar only appears when you are in the Text Tool. By default the bar appears below the InfoBar, but as with all bars in Designer, you can drag the bar to another location. If you have a wide enough screen you may wish to move it to the right side of the InfoBar. Here the Advanced text Toolbar has been moved to appear at the end of the text InfoBar. The … icon switches this extra toolbar on or off. option in the Style menu (Text Tool InfoBar). Do the same for each different heading style you use, to ensure you are never left with a heading on its own at the bottom of a page or column. This is another new paragraph option that prevents a paragraph from being split across a page or column boundary. For example if you have a long two-line paragraph heading, you wouldn’t normally want the second line of heading text to flow to the next page, leaving the first line at the bottom of the previous page or column. Turning this option on makes sure that the two lines of the heading will always stay together. Find this option in the same Paragraph Options menu described above. Update the heading styles in your existing documents in the same way as described for Keep With Next Paragraph, above. In order to connect a list to a previous one, right click on the list and select the menu ‘List Properties…’, to open the list properties dialog (see screenshots above). Check the ‘Link to previous list’ option to link lists. 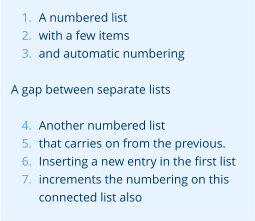 When you do this the lists will take on a common numbering format. Size This field allows you to change the size of the number or bullet character for the list or sub-list at the caret. Color Change the color of the bullet or number. You can either select a named color from the drop-down list, or click the Edit button and use the color editor to choose a color. Once you have opened the color editor in this way you can also click on any of the colors on the color line, if you want to choose a standard color. In the Mar 2017 update the use of this option was extended to also work with bulleted lists and sub-lists. When the option is checked, the current list picks up its settings from the previous list at the same level and of the same type. So set this option on a bulleted sub-list and it will pick up the bullet symbol, margin, indent, color, etc. settings from the previous sub-list of the same level. 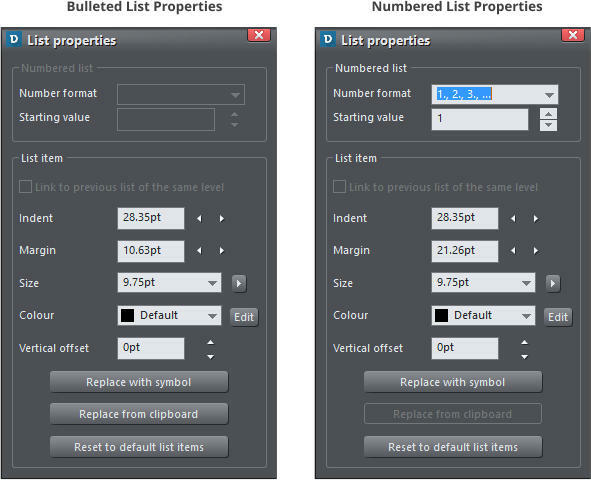 Vertical Offset This option allows you to adjust the vertical offset of the bullet/number relative to the list text. This is particularly useful for bullet symbols because the vertical positions of these vary, so depending on which symbols you choose for your bullets (see below), you will often find they don’t align nicely with the list text. So use this vertical offset facility to adjust the alignment. Indent The indent is the space to the right of the numbers/bullets (the space between the numbers/bullets and the start of the list text). So you can use the Indent controls to adjust this spacing for the list at the caret. Margin The margin field controls the space to the left of the bullet/number, so you can use these controls to adjust the horizontal offsets of sub-lists. Replace with Symbol This button is enabled for bulleted lists only and allows you to choose a different symbol for the list. It brings up the symbol picker window, which lets you choose from hundreds of different symbols. You can also search by keyword if you are looking for a particular symbol. 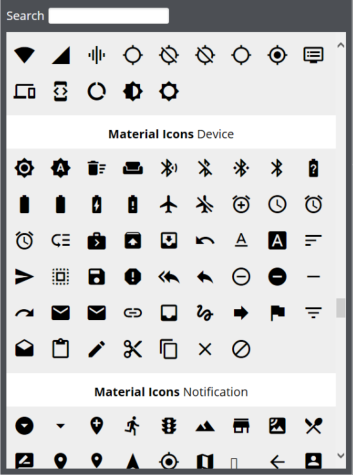 If you choose any of the Material Icons symbols, you will probably need to adjust the vertical position of the symbol, as described above. Here’s an example:  A list using a graphical bullet symbol from the Symbol library.  In this case the symbol can be found searching for ‘bullseye’.  In addition the bullets have been colored red and had a vertical position adjustment. A great benefit of using Symbols this way is that they are just characters from a symbol font, and so zoom without quality loss, are resolution independent and look good on high-res devices such as Retina screens. Replace from Clipboard Designer allows you to use any graphic for your bullets or numbers in lists. Search for “Graphical bullets” in the help for details on how to do this. The Replace from clipboard button in this dialog does the same as the Paste as list bullet and Paste as list number operations in the context menu. Various other small list editing improvements have been made in this update. 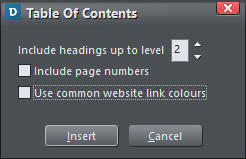 The Link dialog now has an option to link directly to any heading in your document. Previously you needed to add an anchor name manually to each heading, in order to link to the heading, but this is no longer necessary. Just select the heading you want to link to from the list. The new option Insert > Table of Contents … builds a table of contents automatically and inserts it at the text caret. This operation works by finding all the headings in your document that use a Heading text style (Heading 1, Heading 2, etc.). 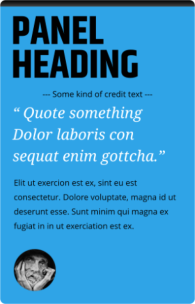 It won’t find headings that you have formatted manually, for example by just making text bold - you must have a heading text style applied to the headings. When you invoke this operation, the following dialog appears. This lets you choose which headings should be included in the table. If you only want your top level headings (usually Heading 1) to appear in the table, set the level to 1. The table of contents at the top of this document, for example, was generated with headings up to level 2, so only Heading 1 and Heading 2 headings are included in it. Select this option if you want to include page numbers in your table. The page number style is chosen to match the style of page numbers you have in the same document, if there are any. Otherwise it uses the default number style. The table includes tab stops on each line so that the page number appears near the right edge of the text column or area. Each entry in the table of contents is linked to the appropriate heading in the document. So this option lets you choose how the links appear in the table. If selected, the links will use the document’s link colors, as specified on the Website tab of the Utilities > Web Properties dialog. the table of contents in this document, the top level headings (TOC1) were changed to use a larger font. As you update a document, adding and removing headings, you will soon need to update your table of contents. To do this place the text caret anywhere in the table, right-click and choose Table Of Contents > Update from the context menu. The table is updated, while preserving any changes you made to the TOC styles. The Table Of Contents context menu also includes a Remove option, for removing the table. It also has a Properties option, which brings up the same dialog you used to create the table. This allows you to change the properties of an existing table, for example to turn page numbers on or off. You can now align text within text areas vertically, so it’s top, center or bottom aligned. This is useful wherever you want to align multi-line text vertically with other features on the page, especially text that you want to edit regularly so the number of lines varies. To change the vertical alignment of a text area, place the text caret in the text and select the button on the advanced text InfoBar. This reveals a menu allowing you to choose the vertical alignment. This option is not available for text columns or simple text lines. Note that unlike normal top-aligned text, centered and bottom aligned text cannot currently be repelled. So objects with ‘Repel text under’ turned on will have no effect on such text. Many modern OpenType fonts include typographical ligatures, which allow pairs or sequences of consecutive characters in text to be displayed with a single glyph. They are used to improve the legibility and presentation of text and to introduce stylistic flourishes. Some fonts have very few or no ligatures, others have many and may also include multiple Stylistic Sets (see below). Ligatures are organized into the following groups and you can choose which groups to turn on or off independently for any range of characters. Select a character range in the Text Tool and then click on the button on the end of the Advanced Text bar, to access the ligature options. Under the Open Type Ligatures option, you can select any or all of the following groups, for the current selected characters: Standard The default set of ligatures the font designer has provided. Discretionary Discretionary ligatures are usually decorative - to be applied at the discretion of the user. Historical Historical ligatures are mainly ornamental suggesting a historical context. Some fonts include alternative sets of ligature characters that the user can choose from, allowing more flexibility. If any sets are available for any of the characters in the current text selection, they are listed under the Stylistic Sets sub-menu, where they can be turned on and off independently. Ligature settings can be used in text styles just like other text attributes. Text styles can now be marked as “hidden” in the text styles properties dialog, which means they won’t appear in the main styles list unless the text caret is located in text that uses that style. This is useful to help avoid the styles list becoming too long in documents that use a lot of different styles. Some SmartShapes such as the bar and column charts have their own text styles and these are now automatically made hidden styles, so they don’t appear in the main styles list. Similarly the TOC styles used for Tables of Contents are also hidden. Use the “Show hidden styles” option in the styles menu to have all styles included in the styles list. Additionally hidden styles can’t become current, so any new text you add to a design should never use a hidden style by default. Designer Pro now has a new “language” document property. This determines what language new text added to the document will be set to, for the purposes of spell checking, instead of assuming the document language should be the same as the language your device is set to. This new property can be seen and modified with the new Document language option in the Spell Checker menu in the Text Tool. You can still set any text in your document to any language, regardless of what the “Document language” property is set to, so you can still have a mixture of languages in your documents when required. If you change the current document language, you are asked whether all existing text in the document should also be set to the chosen language, or left unchanged. When you open an existing 12.6 or older document, the document language is automatically set according to the language on the Normal text style in that document. Newly created documents have their document language set to match the language setting of the current device, as with previous versions of Designer. • (Nov 2016) A Delete Style operation has been added to the styles menu. So you no longer need to locate and remove every reference to a style in order to remove it from your document. • (Nov 2016) The text syle properties dialog now includes the option to set the outline level of a heading style. The outline level is used when inserting a table of contents. The level determines the indentation level in the table and you can specify the maximum level of heading that should be included in the table. For example the table of contents at the top of this document only includes levels 1 and 2 (Heading 1 and Heading 2), to keep the size of the table down. 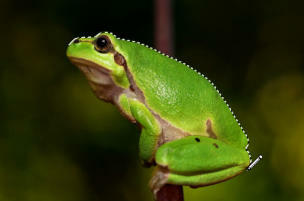 • It’s easier and more predictable to select and cut or delete list items or single line paragraphs (such as headings). If you select a whole line from start to end, including the Carriage Return on the end, then a cut / delete will remove the whole list item. If you partially select a list item or line (e.g. not from the start of the item, but including the end of the line), then cut / delete will no longer join the following paragraph to this one. You can now give individual objects names in the Page & Layer Gallery, to help find objects and to organize your designs. Change object names the same way you change layer and page names in the gallery - just click on the name while the object is selected in the gallery, or right-click on it and choose Rename object. In previous versions of Designer, when you exported a design as a psd file, each Xara layer in the design became a separate layer in Photoshop. And similarly when importing a psd file, each psd layer became a Xara layer in Designer. Now instead we map psd layers to and from Xara objects instead of Xara layers. This is a better fit between the two applications, because whereas in Photoshop effects and blend modes are applied to whole layers, in Xara the same tools are applied to objects, not layers. So it’s more useful to map Xara objects to and from psd layers. • Generally improved text reconstruction, including better justification detection and line spacing accuracy. • Clipview optimization (removal of unnecessary clipviews) • Improved import of bulleted/numbered lists • Support for PDF/X 4 export (July 2017) • And many other small improvements (Nov 2016, Mar 2017 and July 2017). • Import of diagrams (SmartArt objects, art borders, picture effects and other constructs) • Many other small improvements to both import and export (Mar 2017). Improved import of shapes, hyperlinks, text styles, gradients, transparency and many more improvements and fixes. General reliability fixes. SVG blur effect import improvement. Designer Pro X includes an upgrade to ‘Website M’ hosting, free for one year as part of our new Update Service (worth $1.99 a month). This includes 2GBytes of free web hosting space and one free domain name (e.g. yourname.com or .co.uk or .de, and others). Plus you can password protect your web pages. Xara Online Designer offers an innovative and ultra-simple way to view, edit and update Xara documents and websites using a web browser on any computer or tablet (yes, even a Mac or Android tablet! ), from anywhere in the world. Online Designer also gives you the ability to work on documents in collaboration with friends, colleagues and clients. Online Designer remains in beta, but it is evolving rapidly, you can track the latest updates here. Access to Online Designer is included with all copies of Designer Pro while Online Designer is in beta. You can sign in to Xara Online Designer here: cloud.ixara.com You can sign-in the first time using the Xara option on this page, enter the username / password you used to purchase Designer Pro. Once you’ve signed in you can connect to any cloud drive (Dropbox, Google Drive, Microsoft OneDrive) to access Xara files saved to any of these services. Once you have connected a cloud drive, then next time you can one-click sign-in using the cloud drive links. See our Outsider Tutorial An Intro to Online Designer for more information on how to get started.